>99% ; multiple methods, refer to CoA for details. Aphidicolin is an antiviral antibiotic produced by Nigrospora oryzae and other fungi. Aphidicolin inhibits the growth of eukaryotic cells and certain animal viruses by selectively inhibiting the cellular replication of DNA polymerase II or the viral-induced DNA polymerases. The drug may be useful for controlling excessive cell proliferation in patients with cancer, psoriasis or other dermatitis, while having no effect on non-multiplying cells. Aphidicolin inhibits the growth of eukaryotic cells and certain animal viruses by selectively inhibiting the cellular replication of DNA polymerase II or the viral-induced DNA polymerases. The drug may be useful for controlling excessive cell proliferation in patients with cancer, psoriasis or other dermatitis with little or no adverse effect upon non-multiplying cells.Aphidicolin is a tool in cell proliferation and differentiation research. 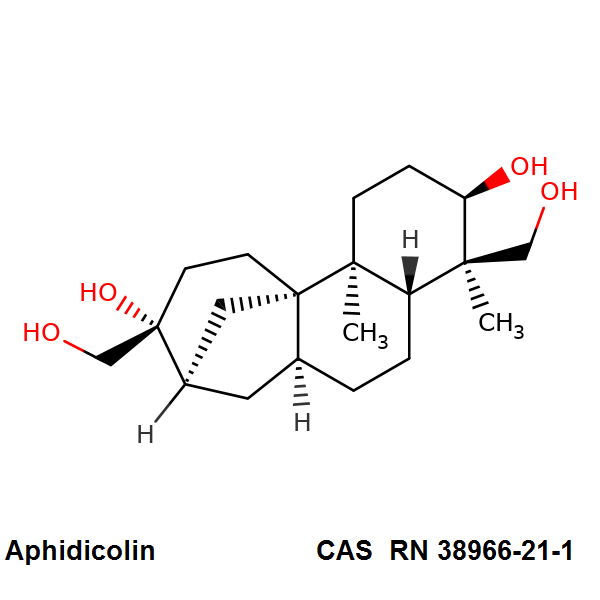 Aphidicolin may possibly be used for controlling excessive cell proliferation in cancer, psoriasis or other dermatitis with little or no adverse effect upon non-multiplying cells. Refer to MSDS for further safety and handling instructions.